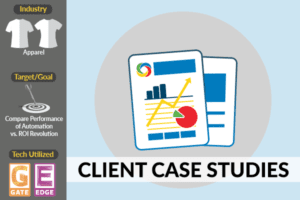 An apparel retailer and long-standing ROI Revolution client wanted to make the switch to an automated bidding service. Thinking that cheaper fees and automated bids were the answer, they embarked on a four month test run, monitored by our in-house team. What they learned was an absolute shock to them (though not so much to us!). While they were paying lower fees, they were also hemorrhaging traffic and sales at an alarming rate. In this report you’ll uncover exactly what went wrong, why it happened, and how ROI Revolution’s customized approach focuses on each client’s unique business opportunities.